Are you tired of being nagged by the buzz made by mosquitos? Do you sometimes feel and think that the repellents you are using are not working in any way? Are you tired of having to hide the ugly bites marks on your face, arms, and legs with makes ups? Are you sick and tired of spraying yourself and applying lotions on your body? Are affected by the smells emitted by some mosquito foggers? Well, worry no more because Thermacell mosquito repellent is here to solve the above and many more problems for you. What is Thermacell Mosquito Repellent? It is a portable and lightweight device that produces an odorless vapor that will keep mosquitoes, flies and any other insects that are looking to bite you off. It offers a fifteen-foot protection space. Its package contains one repeller with twelve hours of refill- three repellent mats and one butane cartridge. No open flames making it relatively safe to use. Its light weight makes it easy to carry on as you move around. You can take it on your hand but you must know that it will warm up over time, and so it is not safe to put it inside your bag while warm. You can holster it on your bag, put it on the table or lay it down on the ground. How Thermacell Mosquito Repeller Works? The thermacell repellent contains a butane cartridge that heats the mat leading it to emit the odor less gas that takes care of the mosquitos that are around you. You will need to install the mat at the right side of the grill at the top, and then switch on the device. You then place the device at your place of convenience. This tool mat is bound to last up to four hours while one butane bottle will last up to 12 hours before needing to be replaced. The mats last up to four hours each so you will need to change them three times in twelve hours. The good thing is that you don’t need to use it for 12 consecutive hours. you can use it once in a day, twice, the next day or the next week. Benefits of Thermacell Mosquito Repellent. 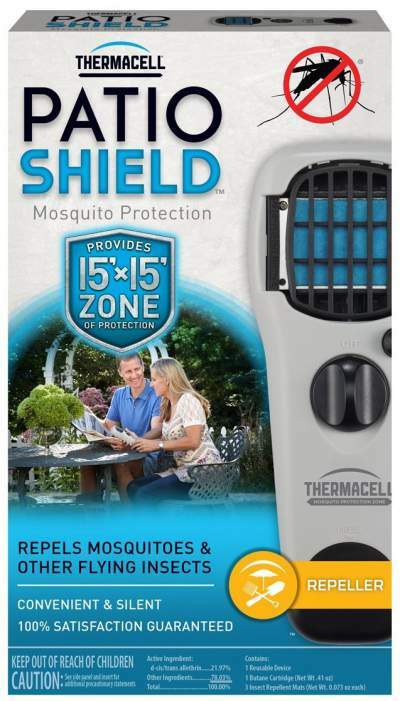 Using the thermacell mosquito repellent will relieve you of using messy lotions, and harmful sprays as this repellent will help safe guard you and your family so long as they are within the 15 feet radius. It also offers protection against other insects such as black flies and biting pests. Its portability protects you when moving around; you can holster it or choose to carry it in your hand. You can use it while relaxing in the yard, when attending to your garden, on hiking, fishing and camping expedition, or when you are hosting guests outdoors. It is better compared to sticky and smelly repellents on your skin, and so you are saved from inhaling chemicals as this gas is odorless. Is it Safe to Use Thermacell Mosquito Repellent? Yes, it is, for this product has been evaluated and passed on as safe and efficient by the EPA. Yes, it requires butane to work, but it has been built to work with no flames. The fact that it does not include any direct contact with the skin makes it relatively safe to use around people. The odorless gas is also good news for allergic people because they will not smell anything hence its safe from causing an allergic attack. It is best if kept out of reach of children; also take care not to inhale the gas directly. The used mats should be well disposed of so as not to harm other animals and also make sure that your pets don’t come into contact with it while it is in use. It’s harmful to fish, and so you should take care and not dispose of it in lakes, rivers, or in a fish pond. 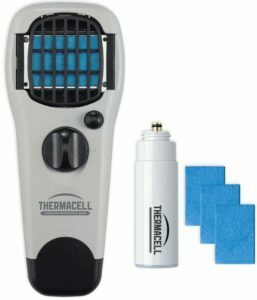 Where to Buy Thermacell Portable Mosquito Repeller and its accessories? Amazon is the first choice to buy. There are quite a lot varieties of thermacell repellents available in the market. ThermaCELL Camper’s Kit – Provides protective barrier against mosquitoes, black flies, and other biting pests while you for camping, hiking etc. Cannot be used near flames of fire. It only lasts up to 12 hours.